Product #46037 | SKU TL-UE300 | 0.0 (no ratings yet) Thanks for your rating! Is your MacBook or Ultrabook missing a Gigabit Ethernet port? 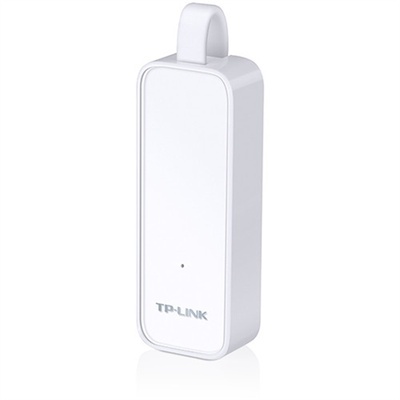 The solution is the UE300 USB 3.0 to Gigabit Ethernet Network Adapter from TP-Link . With this adapter, you can connect your Windows, Mac, or Linux based computer to an Ethernet network via a USB 3.0, 2.0, or 1.1 port. When connected via a USB 3.0 port you can take advantage of enhanced network speeds allowing you to stream HD content, download large files quickly, and much more. The adapter features one Gigabit Ethernet port and one USB 3.0 connector that can be folded down into the adapter for easy, on the go storage.